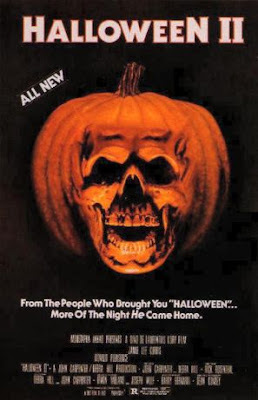 The fans had to wait a whole three years for the sequel to Halloween ,with great news that all the cast had signed on again for another outing,with Donald Pleasence back,with Jamie Lee Curtis back also. Only this film was not to be directed by John Carpenter,but by Rick Rosenthal,with Carpenter just on producing and writing duties. 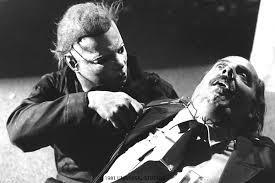 The film is a direct carry on from the previous film,on the same night,after Laurie has gone to hospital,and Michael's body disappearing,even though he was shot 6 times by Loomis. Michael is back and is determined to kill Laurie,at any cost,set almost entirely in the Hospital,with a higher body count,and more incentive kills once more. We do find out in this film Michael's determination to kill Laurie,as she finds out she is in fact adopted as a young child,and is in fact the younger sibling of Michael. Jamie Lee Curtis gives an outstanding performance once more,as the survivor Laurie Strode,Donald Pleasence is a determined man again to get Michael back either where he belongs,or preferably dead. But can anybody kill this beast of a man,who has been stabbed,shot 6 times,twice more in the face,and finally being burnt. Is this the end for Michael Myers as we know it. You will have to wait and see.